When I was in my teens I would turn on the family’s Zenith television and jump between the four channels that we were limited to. Often during the early summer and the fall, especially in non-prime time or the off hours, a stations surplus ad were bought up by Sunn International Pictures or Pacific Western, advertising their latest low budget movie releases. Commercials for titles like In Search of Historic Jesus, Where the Red Fern Grows and the classic Late Great Planet Earth, based on the end times book by Hal Lindsay blared over the television, followed up by announcement of a series of rural theaters were these movies could be seen. These showmen would make a movie for little or no dollars, buy up commercial television spots by the bucket load, then four wall their movies in primarily in rural theaters and they would saturate the television airwaves with ads for the movie….they would clean up. Gone in 60 Seconds is a movie made by Hollywood outsider H. B. Halicki. Halicki wrote, starred, directed, produced and heck even did his own stunt work in his now classic first movie. The pursuit in Gone In 60 Seconds is the longest car chase (40 minutes) in movie history and takes place through five cities as he attempts to lose the police who are in hot pursuit. Nearly every civilian vehicle seen in close proximity to the main chase was owned by Halicki. This resulted in several cars appearing multiple times in the 40-minute sequence. 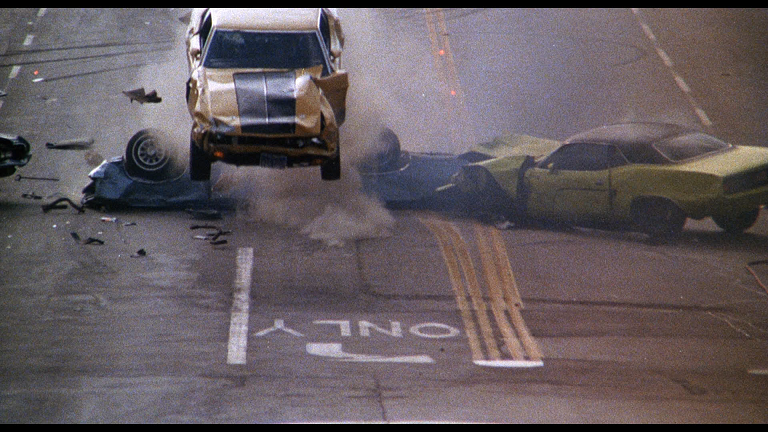 Gone in 60 Seconds (1974) revolutionized the way car crash films were made and became an instant low budget classic, grossing more than $40 million at the U.S. box office, a huge number for a 1974 independent movie. “Eat My Dust” is a broad, action comedy from Roger Corman and Ron Howard. Just one of a number of car chase / car crash movies he made during this period, the movie stars the always likeable Ron Howard, and Christopher Norris, known best for her portrayal of nurse Brancusi from Trapper John M.D. In the movie Ron Howard steals “Mabel”, the prized vehicle of race car driver Big Bubba Jones. Ron and Christopher as well as an ever-increasing entourage, partake in an epic pursuit that takes up most of the hour and a half long run time. Made on a $300,000 budget the movie made $5 million at the box office in 1976. These movies made money, lots of money, but Hollywood has completely and utterly abandoned the rural market. At one time the rural market was foundation for the drive-in movie as well as exploitation or “B” movies, today it has been largely ignored. In the past movies like “Legend of Boggy Creek”, “Texas Chainsaw Massacre” and “Grizzly” built their success from a primarily rural audience. About 60 million people, or one in five Americans, live in rural America. In general, rural areas are sparsely populated, have low housing density, and are far from urban centers. Urban areas make up only 3 percent of the entire land area of the country but are home to more than 80 percent of the population. Conversely, 97 percent of the country’s land mass is rural, but only 19.3 percent of the population lives there. That is an audience of 60 million that Hollywood has stopped making movies for. At one time movie producer realized that small-town America had deep economic and cultural distance from New York City. Had had to be treated in a distinct fashion. It was in short, its own market. The perception of movie executives changed in the late 1970’s…..the problem in that they were wrong. Changes in mass culture were impacting society, reshaping the United States. Movie execs thought the changes in American society were applied evenly. As we now know they were not. Hollywood began to truly feel that the same picture which played at the NiteHawk Theater in Brooklyn, will have the same market appeal as it has at the Roxy Theater in Northampton, Pennsylvania. In the first decades of the twentieth century, Hollywood knew full well that there were wide differences between how everyday life was experienced in the largest cities of the United States and in its small towns and rural areas. In 1910, about 12 percent of Americans resided in the major metropolitan centers of 500,000 or more people, while five times as many people, or 63 percent, lived on farms or in villages with populations smaller than 10,000. In their pursuit for a global homogenized product, Hollywood has chosen to ignore a market the size of France or England. The rural market has quite understandably decided to return the favor. There is a huge difference in the box office between rural and urban theaters. Movie attendance in the U.S. has been trending down for the past decade, with last year being a particular low. Suffering from a weak summer season, the number of tickets sold in 2017 dropped 6% from 2016, leading to a 2% year-over-year decrease in total U.S./Canada box office, according to a report by our dear friends at Motion Picture Association of America (MPAA). Of course, another important contributing factor is the change of Hollywood’s release strategies in recent years. Responding to an increasingly global market and the higher risks that carries, many film studios have concentrated on big-budget superhero movies and sequels of established franchises leading to fewer releases in total and fewer mid-budget studio releases. With few mid-grade flicks to draw in movie-goers on a regular basis, audiences are looking elsewhere for entertainment, leaving smaller theaters struggling to tread water. This no more pronounced than in the rural markets. After World War II, and as America began to become suburbanized, rural movie theaters began to close across the nation in the 1950s. In America, movie attendance rates dropped by half or more. Cities expanded into the surrounding countryside through the expansion of suburbs and bedroom communities. Empty farmers’ fields were turned temporarily into drive-in movie theaters, and then later into more subdivisions. The new generation of movie theaters built in the 1960s, 1970s, and 1980s were concentrated in suburban shopping malls and commercial centers. Both urban downtown’s and a great many rural centers lost all their movie theaters. The small-town movie theater which once held the heart of the rural down town center started failing in massive numbers. As a result, many of these small downtown cores fell on very bad times. In an odd twist of fate, malls, often the destroyer of drive-ins are now falling rapidly on their own sword. Major circuits who have often cast their lots with mall operators are finding themselves feeling the cruel winds being inflicted by the rise of the digital economy. It is the rural economy which seems to be on the rise. As of this moment in the economy of the rural America, jobs and incomes are all trending in the right direction. Current efforts to improve rural access to infrastructure will offer the greatest opportunity to make a significant dent in the rural/urban economic divide. It looks like slowly; the rural market is on the upswing. State officials in New Mexico, Illinois, Indiana, Kentucky and Iowa have all begun programs to revitalize rural based performance spaces. This includes movie theaters. They know the market is rising but with a lack of infrastructure to support a rising rural population and their entertainment needs. I know first hand the State of Illinois would very much like to re-invigorate and re-ignite the movie going economy in small centers. The Iowa Economic Development Authority’s Iowa Downtown Resource Center announced last year a pilot program aimed at rescuing performance venues in historic buildings in seven rural communities. The Illinois Historic Preservation Agency also has helped historic theaters like the 500-seat Phoenix Opera House in Rushville, Illinois. The same has happened in Spencer Indiana, because of a grant by the Cook Foundation which saw the renewal of the Tivoli Theater. A resurgence of rural American movie theaters is slowly indeed taking shape. Here is the rub, Hollywood has ceased to even to consider a 60 million market worthy of addressing. From a firsthand experience when a movie like Talladega Nights was released, I often witnessed firsthand record setting audiences. Rural America is not urban America, and for too long Hollywood has purposefully ignored this increasingly vibrant market. As Hollywood turns its eyes to foreign markets, increasingly the urban market is being ignored as well. Folks like Rob Shilts, the man behind the resurgence of the amazing Historic Artcraft Theatre I am sure will tell you the secret to his deep success. I am 100% positive he will tell you if you don’t ignore your community, they will not ignore you. The abandonment of the rural market is a deep mistake A mistake which should be corrected.